The history of almshouses and the provision they have made for the elderly poor goes back to the Middle Ages. In the early nineteenth century, a number of enlightened and philanthropic people, who opposed the harsh new Poor Laws, were responsible for founding many new institutions to ease the lives of the ‘better class’ of the elderly poor. St Marylebone Almshouses, in St John’s Wood Terrace, was an early example of the typical urban Victorian almshouse, although it was conceived before Queen Victoria came to the throne, in 1837; £500 was bequeathed to the poor of the parish of St Marylebone in the Will of Count Simon Woronzow (the naming of Woronzow Road acknowledges his benefaction) dated 1827 and proved in 1832. Count Woronzow, who came from an old aristocratic family in the Crimea, had been the Russian ambassador in London and spent some of his retirement in St John’s Wood; his daughter married the 11th Earl of Pembroke (of Wilton House) and their son was Sidney Herbert, who was prominent in politics and a friend and supporter of Florence Nightingale. Herbert tried to improve conditions in the Scutari hospitals during the Crimean war and he was an organiser of the volunteer movement. In 1836, the £500 was transferred to the Vestry of St Marylebone to carry into effect the proposed erection of the almshouses. This sum was augmented by donations and subscriptions of charitable individuals and the local landowner, Colonel Henry Samuel Eyre, leased a site to John Wardell and Hugh Biers, trustees, for a term of 99 years at a peppercorn rent. The architects, John Pink and John St Erlam, designed an Elizabethan style building (which was replaced in 1965 in neo-Georgian style). Building was completed by mid-1837 and the first residents moved in during that year. The object of the institution was ‘to afford an asylum and means of support to aged and decayed parishioners of St Marylebone, and their widows, who are of good character and industrious reputation, who have paid 10 years rates (later revised to 7 years) in the parish …. and, who, by unexpected reverses, or the failure of their accustomed means of support, have fallen from a state of respectability into indigence, but have not had recourse to Parochial Relief’ – the concept of ‘the deserving poor’ forever lies behind Victorian philanthropy. The income was to be derived from annual subscriptions and donations and from Stock purchased from the proceeds of any property bequeathed to the trust. Clergy were encouraged by the promise of honorary membership and Life votes to preach sermons to raise funds. Trustees (one group for the building and another for the endowment fund) were appointed, who with a Treasurer, an Hon. Secretary and a Board of Management (made up of Annual and Life Members elected at Annual General Meetings) had complete charge of all aspects of administration. They had the power to expel any inmate who wilfully violated the rules or gave a false statement of their circumstances prior to admission. The superintendent or matron could be chosen from among the inmates or otherwise. Further admission criteria included being over the age of 60, although wives were eligible at 55; until 1853, however, they were obliged to leave on the death of the husband if they had not yet reached 60. An insight into Count Woronzow’s and Colonel Eyre’s real concern and compassion for the plight of the poor is displayed by certain terms of the bequest whereby, on behalf of both gentlemen, two inmates each, who had been in receipt of parochial relief, could be nominated. At the end of its first year there were 71 inmates in the almshouses (57 men, 7 of whom lived there with their wives). During the year one seventy-six year old had died and one resident was sent to the parochial infirmary because of his ‘extreme debility and helplessness’. The number of inmates, whose average age was around seventy, remained much the same over the first ten years but, as to be expected, the number of deaths per year increased as those of long-standing grew older; in 1845, seven people died but many inmates were then in their eighties The Annual Reports paint a picture of modest but continued growth of income and capital from various sources, which enabled increased benefits to be given to residents from time to time. The original allowance, in 1840, of one ton of coal annually and two 2lb loaves of bread, had become one and a half tons of coal, four 2lb loaves and twelve bundles of firewood. In 1842, an amount of money was given at Christmas, for the first time: 7 shillings and 6 pence to married couples and 5 shillings to single inmates; by 1845, annuities of £4.10.0 and £3.0.0.were being paid in monthly instalments (i.e. 7/6per month couples, 3/- singles). By the end of its first decade, through the efforts of subscribers, fund-raising events, such as the public dinner given for 300 people at The Eyre Arms Tavern, appeals from the pulpit, bequests and corporate donations (e.g. 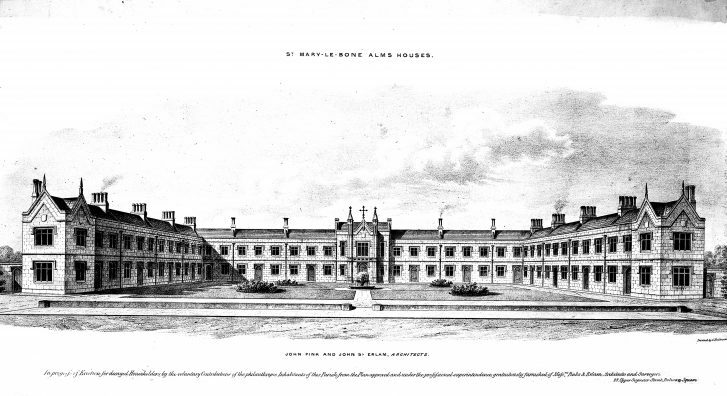 from the West Middlesex Water Works and the Western Gas Company), St Marylebone Almshouses had an annual income of £800, a cash balance of £639.6.2 and an Endowment fund of Stock Consuls worth £7, 800. It was a remarkable achievement. Expenditure as well as income was increasing in new ways: the Superintendent, (formerly called the warden) an inmate called Robert Andrew Watkins, aged 68 and for 23 years a ratepayer, was paid £13 pa; external re-decoration had been undertaken regularly since 1845, fire escape ladders were purchased, a stucco inscription had been placed on the front of the building and a considerable amount of money was spent each year on tablets, in the boardroom, recording donors’ names. This page was added on 10/12/2016.